Something mysterious happens when you spend time in Ubud. With its ceremonies and temples, cafes and art galleries, rice paddies and music performances to enjoy, life appears to be one big festive celebration. Once you tune into the essence of the place, you will forever want to return. The Alila Ubud is positioned high up on a ridge with views of lush green river valleys leading to the sacred river Ayung below. 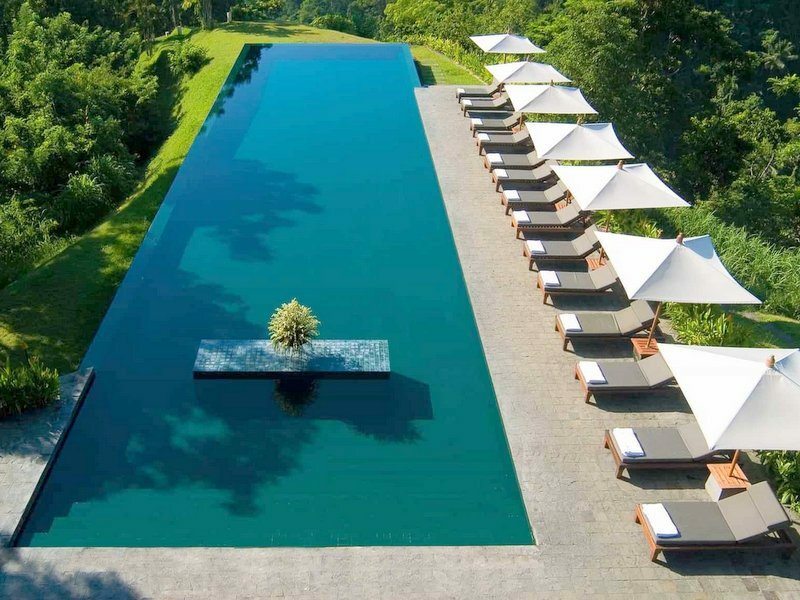 It is perhaps best known for its dramatic infinity pool that is one of the most photographed resort pools in the world and an inspiration for many others. This tranquil and secluded hillside retreat is located 15 minutes from Ubud. Denpasar is 30 km’s away and if traffic is kind, you can be in Ubud in 35 minutes. The Alila blends contemporary design and traditional Balinese architecture, the secluded courtyards, spacious terraces and private gardens create an intimate feeling like none other. I’ve had the immense pleasure of staying here twice; once on my own for work as a travel wholesale product manager – the resort was then The Chedi – I knew I had to return. With someone, anyone. The second time was with my boyfriend on a romantic escape. We are now married. The place does crazy romantic things to you. Here is a tip– not a great hotel for the solo traveler, it is a couples’ paradise! The 12 villas offer a choice of luscious hideaways. Enjoy the privacy and tranquility of a Pool Villa nestled within a private stone-walled garden with private pool. Utterly restful and relaxing. Or retreat to a loftier perch – Valley Villas overlooking the lush green Ayung River valley or spacious Terrace Tree Villas hidden above the breezy jungle canopy – where privacy comes with the most amazing views. Alila Ubud’s Culinary Team artfully prepares Balinese cuisine and healthy natural fare as well as some of the finest international dishes available anywhere. Soaring views are a feature of the welcoming bar and a dining experience overlooking the dramatic emerald-green pool that floats above the plunging valley. Healthy breakfasts from an a la carte menu changed regularly, which was such a refreshing change from the wasteful buffet style breakfast, with freshly cooked bread and local fruits daily, such a great way to start the day. A morning offering welcomes you as you enter the Spa Alila. Made from banana leaves and filled with rice, sweet cakes and flowers, these are placed in temples and shrines in the early mornings. Three finishing splashes of holy water create a positive mood for the day ahead. The ambiance brings in the natural world of Bali into the treatments and the rooms. Imagine outdoor tropical waterfalls and bathtubs set in lotus ponds and inhaling the mountainside fragrance of Bali. Ahhh, to be there now. Spa Alila, provides unique treatments blending ancient Asian healing techniques with age-old beauty recipes featuring the curative benefits of fresh, natural, quality ingredients. Trained in anatomical physiology, massage, meditation and service, they combine the latest organic nutrition and health knowledge with the most essential element – warm, genuine care that flows from the heart through the hands, to stimulate, rejuvenate, balance and relax the mind and body. It is easy to forget about the world while you transcend into a state of calm and tranquility at Spa Alila.